Ganesh chaturthi is a long way off yet. But one never needs an excuse to organize a little event for any god, let alone Ganesha. The God of Opening Ceremonies, I'd call it. The intelligent one, the wise one, the cunning one too I'm told according to some stories... he loves his food - particularly one sweet. A story goes that one day he ate so much of that particular sweet - kadubu - that he found it really hard to walk home. So he grabbed a little mouse going by and used that as his chariot. Mid way, the mouse got spooked by a snake and jolted Ganesha off him. His stomach burst and all the sweets fell out. A furious Ganesha fixed himself up and then grabbed the snake to secure his stomach and the food inside. The moon, who was looking at all this, found it hilarious and started to laugh. 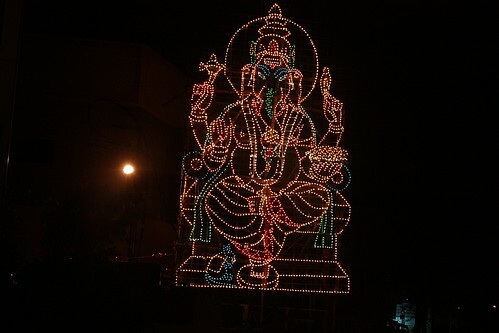 As Gods do, Ganesha got mad at this and cursed the moon. So on that festival where we celebrate Ganesha... if you look at the moon, apparently you too will be cursed. I love Indian Mythology. So many stories... even about how Ganesha got his elephant head. I've heard various versions of it but the one I grew up with was the one where Parvati created a little son off the dirt from her body to act as her bodyguard when she was off to take a bath. The little boy stood at the door, guarding her, when her husband came home and tried to enter. They fought cuz well... the boy didn't know who the guy was right... and the husband, who was a God as well - Shiva, the destroyer - promptly cut the boy's head off. And then Parvati came out, clean and fresh and sees the boy without his head and promptly got mad. Shiva then had to order his disciples to go find a head for the boy, which had rolled off or whatever and the head had to to be facing east. And the only head they found was an elephant's. And they got it back. A head's a head... and so Ganesh, Vakratunda, Vigneshwara... was born. Well I have heard lots of variations in same lore, one being once Shiva struck Ganesha’s head off, and then it was Brahma who suggested to place an Elephant’s head, then Shiva’s disciples took Airawat’s head. And thats how Indra’s Airawat lost his head. Eventually Ganesha lost one of his tusk in fight with Parshuram, where as some say he broke the tusk so that the Vyasa can use it to write Mahabharata. Some also say that Parvati produced Ganesha without making love with Shiva as Shiva being immortal had no desires for a son. Lots of cross connection/references in Vedic literature, isn’t it? I didn't know the bit that Shiva had no desire for a son... but the bit about Parvati producing a kid without the guy is absolutely true. Lots of cross connections sure. And a lot of adultery and other things occur too... i mean if u look at mahabharat - how was Karna born? How were the rest of them Pandavs born? and Indra sending down one of the dancers everytime he wanted to create some mischief. Can't believe with such a brilliant and beautiful model of life, we pretend to be so holier than thou.